Disclaimer: I received tickets to Les Misérables as an opportunity through the Tampa Bay Bloggers and the Straz Center for the purpose of this review. The opinions shared are my own. Confession: Before Tuesday evening, I had never seen Les Misérables, nor had I ever listened to the soundtrack. I knew nothing of the plot. So, that’s not entirely true. While I knew nothing of the story, I was familiar with some of the songs, such as “One Day More”, thanks to Oscar performance by the 2012 film cast. But pretty much my knowledge of the plot included a lady who cut her hair played by Anne Hathaway and some Inspector dude played by Russell Crowe and Hugh Jackman played some part too. Like I said, I went into the performance blind but knew I better bring some tissues because I had heard Les Misérables was terribly sad. If you are in the “never seen Les Misérables” camp with me, be warned. There will be spoilers. The show opens in the bowels of a slave ship. Waves crash as whips and chains crush the souls of imprisoned slaves, where we meet Jean Valjean, a man sentenced to the slave ship for stealing bread to feed his sister’s family. In this scene we also encounter Javert, the cruel and heartless man who hunts down Jean Valjean for a lifetime. Josh Davis as ‘Inspector Javert’ and Nick Cartell as ‘Jean Valjean’ in the new national tour of LES MISÉRABLES. Photo by Matthew Murphy. Once Jean Valjean completes his sentence, he realizes can never truly leave behind the chains of his imprisonment. Society views him worthless and in desperation, he continues on a criminal path until his final heist takes an unlikely turn. As Jean Valjean is pardoned by the victim, a bishop, the holy man saves his soul and encourages Jean Valjean to always be kind and give rather than take. Jean Valjean breaks parole and by doing so, becomes a new man entirely. However, he spends a lifetime hiding in plain sight from Javert. 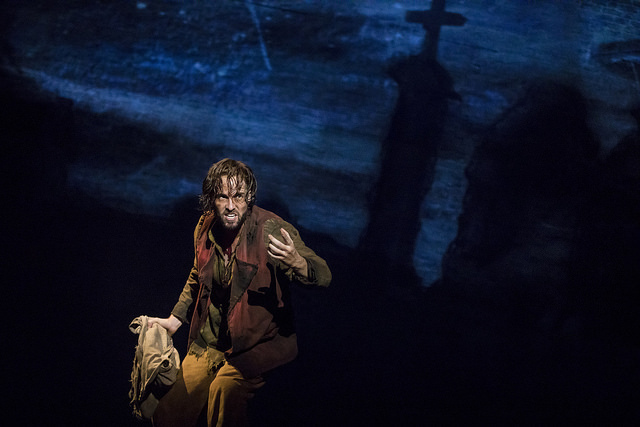 Nick Cartell as ‘Jean Valjean’ in the new national tour of LES MISÉRABLES. Photo by Matthew Murphy. Soon, we meet another broken soul, Fantine, a seamstress in Jean Valjean’s factory. Fantine tries to make ends meet to give a better life for her daughter, Cosette, by paying two seedy innkeepers to watch over Cosette. Sadly, Fantine is near death when Jean Valjean finds her and Jean Valjean vows to care Cosette after Fantine passes away. 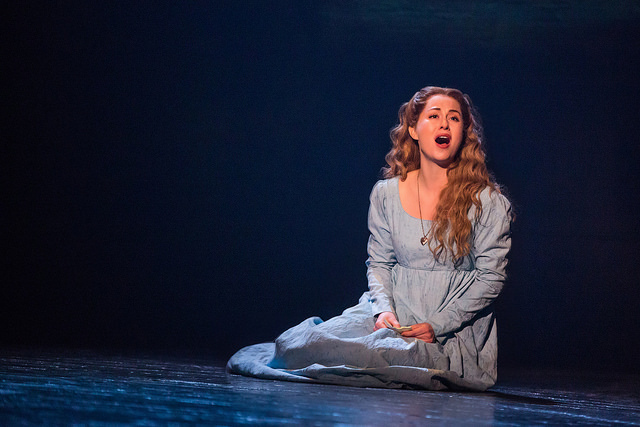 “I Dreamed A Dream” – Mary Kate Moore as ‘Fantine’ in the new national tour of LES MISÉRABLES. Photo by Matthew Murphy. Years pass and in the midst of an uprising (NOT the French Revolution as often misinterpreted), Jean Valjean desperately tries to remain underground while protecting Cosette from love and war. 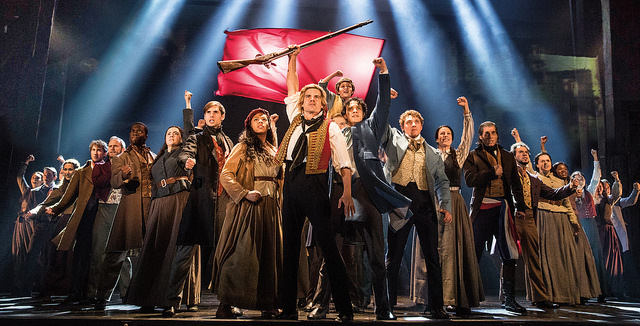 The company of LES MISÉRABLES performs “One Day More.” Photo by Matthew Murphy. 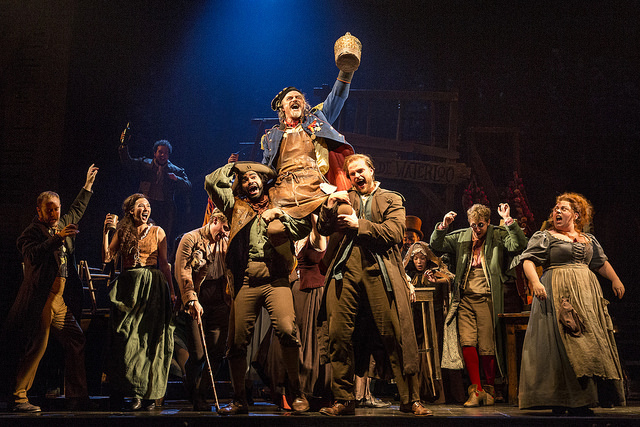 The Les Miz tour company creates a magnificent production by adding a modern flare to an older musical. Through the magic of technology, a massive LCD screen adds some remarkable touches to each scene such as waves crashing on a ship or rolling fog through the catacombs of Paris. For the musical theatre traditionalists, monolithic sets bring embellishments and scene changes through backdrops that roll and turn. As for the musical itself, the cast delivers bone-chilling performances that will make your hair stand on end. While I did not tear up, the opportunity to cry rears its ugly head in many memorable and beautifully heartbreaking scenes. Thank goodness for the comic relief of Madame Thénardier and Thénardier! 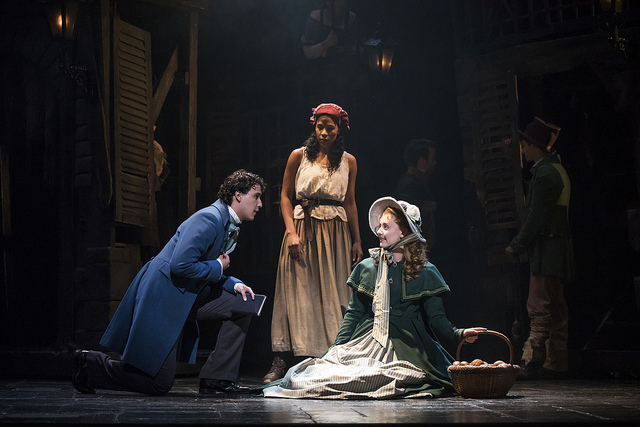 The company of LES MISÉRABLES performs “Master of the House” with J Anthony Crane as ‘Thénardier’ and Allison Guinn as ‘Madame Thénardier.’ Photo by Matthew Murphy. Les Misérables is a must-see for the musical theater lover and I am truly embarrassed for waiting this long to enjoy such a beautiful musical. 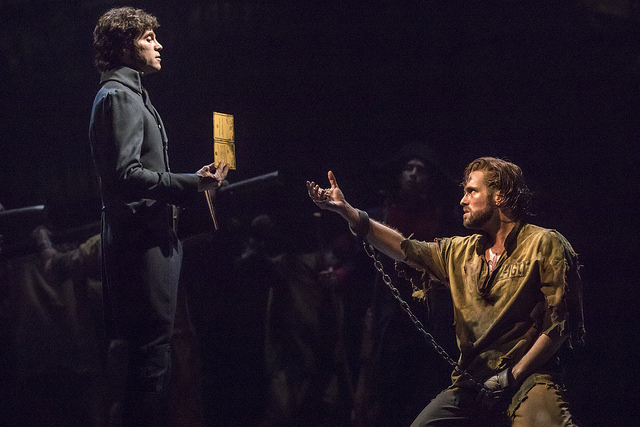 Les Misérables is now playing until Sunday at the Straz Center. 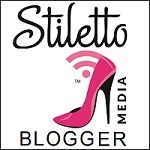 Visit www.strazcenter.org for showtimes and tickets. 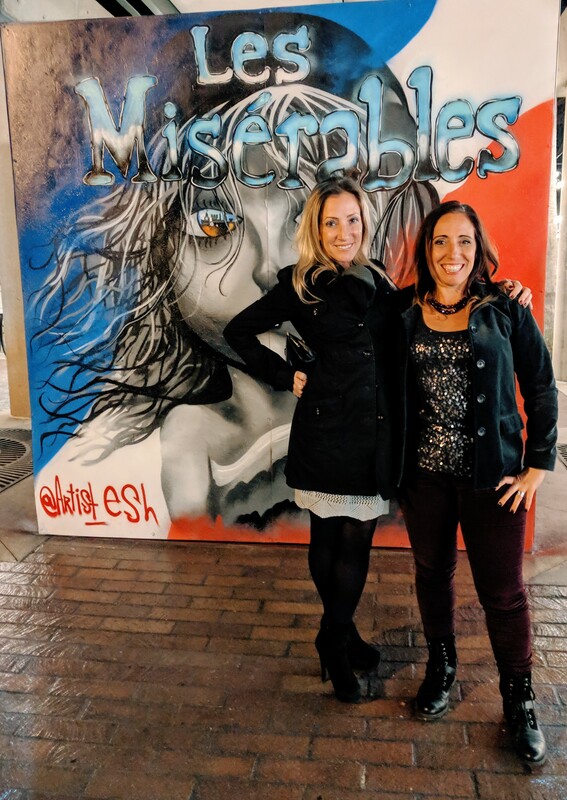 This entry was posted in entertainment, Life, review, Tampa, travel and tagged #BroadwayinTampa, Broadway, Les Misérables, Les Miz, Life, love, musical, musical theater, musings, review, Run DMT, Straz Center, Tampa, theater, theatre, thoughts, travel.